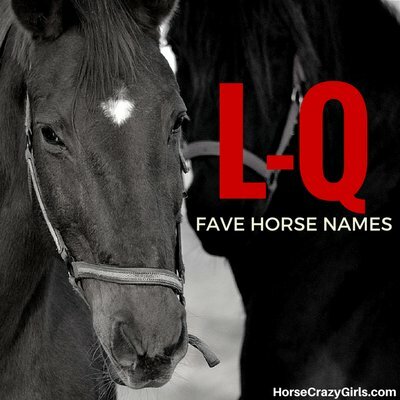 Share your favorite L-Q horse names! Here are fave horse and pony names sent in by girls who love horses. Let us know which ones you like by commenting and sharing your own below! I have no idea why I like it. I guess because I was looking at names at the horse show and kept on seeing "Little Miss". When I got home, I looked at my board and I had a ladybug magnet on it then the name just came to me. Promise - This name fascinates me because when you get a horse you make a "promise bond." You can never break it and no matter if your horse is mean and a big brat, and she makes you angry, that bond will always be there. Majestic Sky - My name is Japanese although I am American. My name means Angel of the Sky and Sky is my favorite word out of it. Horses are majestic creatures that used to roam the earth. Now most are gone but they are still majestic. I've always liked the name Sky and Majesty. Mountain - I like this name because it reminds me of my old horse. He was tall and very bold like a mountain. I love this name because it’s my pony's name and he is the best pony in the world! He’s a 13.3 show pony and his showing name is Hamire Prince Charming. I like this name because it has a certain feel to it that is hard to explain. Plus it sounds very unique and different. It is really cute and fun. It would be good for a palomino. I really like this name because it was my pony’s when I used to go to my riding stables. But i am having my own horse soon and i might call him Monty! I like the name Missy because it sounds cheeky and cute. It also sounds friendly at the same time! A name fit for a queen. This horse will leave you in awe with your mouth hanging open. Because it sounds so faithful and reliable and magical. It would suit a black stallion. This is my horse's name. I named her that 'cause Liberty means freedom and as soon as you open the gate she wants to run free. But aside from her stubborn Texas attitude, she is an amazing horse and I love her with all my heart. Because my horse is color brown so I call him "Peanut". This name gives a diva sound. Because it was my horse's name but then she got put down plus it reminds me of her all the time! My favorite horse names would probably have to be Mario and Leviv because I collect Breyer Horses and those are my favorite. Because it sound just adorable and I am obsessed with this name. Also my cute horse is named Lightning. Because it sounds fun, and energetic. It would be perfect for a jumper or racer. I've always dreamed of a Grey horse. I've read several books with Grey horses in them and it seems to be that Moonbeam was the best name given to any Grey horses. Onyx is a type of rock that is sometimes black. It could be used for a strong horse that is black. Lucky is my favorite horse and always will be! Me and my friend were out riding and a storm rolled in so we ran back to her yard to get them untacked. This name reminds me of honey and it's sweet so it can describe your horse as sweet or a queen. The name means "Golden Queen" in Elvish. Pearl is the nicest horse in the world. She is lazy, really lazy. She won't trot the whole time time around the arena twice. I like OA Electric because that's my horse's name. She is an 18 year old chestnut Arabian mare and she was born in Scottsdale, Arizona. Because I used to ride an old Appaloosa mare that is now 37 years old! She is my favorite horse and I know she loves me even though I sadly don't own her. Because beautiful horses reminds me of the beautiful silver mist and my horse's name is Misty and she is fast! According to a book, it is an imaginary city on the moon and it is the name of a band I like. I really like it for a black horse. Because he was the horse I learned to get my confidence back on then I broke my collar bone on him then just as I had recovered I lost him due to grazing. It sounds really powerful and fast, very noticeable and frightening, yet beautiful to look at all at the same time. Because its my pony's name! She is a beautiful 14hh2 dappled grey Connemara X Thoroughbred mare. I chose this name because it sounds just like a big and powerful horse even though it is of Narnia. Because that is my pony's name. Because she is my beautiful little mare! Misty is a great horse. Because it goes very well with a black horse. It is my 21 yr old bay Championship National Show horse's name and she's a great jumper standing at 16.1. She flies like the wind, her ped is EW Sabask(bask+Sabellina). It would be a beautiful name for a gray horse. It is so mysterious and beautiful, and I love it! Because I just love it and I love paints and if I got a paint its show name would be Painted Moon! Well, ever since I was a little girl I loved horses. Because its my pony's name and he won the horse of the year show. He is called Mighells Palais Gluide Blues because Mighells was the name of his stud. She makes me light up and she shines in my heart. I love that name because it is so cool! I just like the name Luna. I think it sound so peaceful. These are the names of some of the horses at the stable where I ride. Cute name for Piebald Paint horse mare. Purple Mist- Purple Mist is one of my favourite horse name because it sounds so graceful and majestic. Because it's so graceful and soothing. Because it's really cute and my dad had a kitten called Louie and it got poisoned by a neighbor. So I would be grateful if someone could carry on the name. I think its a gorgeous name for an intelligent, friendly horse that is a best friend to all! He was the first pony I rode. Moon Shine was my horse trainers daughter's little pony that I loved but they sold it because she was too big for it but she got a new pony. I like Lulu because she was the horse that I loved at my stable. Mirri is my fave horse name because it is the name of a Brumby in my fave book called The Silver Brumby. Well, so far I like it. Let's just see how it goes when I join! It starts with the same letter so it sounds neat. Because that was my grandmother's horse. It sounds like a strong horse name. Because I know this little foal named Lexi and she's so cute and nice. This is one of my favorite, I don't know why. I also like Lady Liberty. I love the name Luna (after the moon) and there was this beautiful horse I knew who had the shape of the moon on her back! I have a horse named Little Joe and he so cute! He's a short little paint horse. Because my mares name is Plumb Bonita and I think that it is really pretty. Because it's from a program I like and I think it sounds lovely and it's very cute. I also like this horse name because it looks cute with chestnut. Well, it was my first horse's name and I loved her very much. Now she is dead and I miss her more than ever. She was my best friend and my greatest helper. Because it is my baby girl, soon she is going to have a baby! She is a black mare. Because I saw a Shetland pony having that name. It's different and cute and very unusual. It's my fave because it's my fave horse name. I like the song and it is a cool name to me. I just love it! It's my horse's name too. Because that's my last name. It was the name of my grandma's horse and it is beautiful. It would be a cool western horse name. I think it would fit an all black horse with a snip or star! Hi, I'm Georgina and I love the pony name Monty because it was my favorite pony's name at my riding school! Princy was a very sweet horse that my grandma told stories about him all the time and his name should be carried on! Because it is a nice name for a horse. I love this name! I think it would suit a chestnut! It makes me feel warm inside for some strange reason. She is the horse I ride and I love her! My first horse was named that and I love her. I just love it, it's a cool name. I am crazy about horses because they are so cute. And riding them is fun it is like the best thing to do in the world. Because everyone has a dream and with a horse I'm living my own dream. I believe that the name represents pride courage, and hope to believe that dreams come true. He is sweet, loving, and fun to ride. He would never buck or injure anyone. He is fast but only if you want him to be and he is more gentle than any horse. Because he is the bravest and the sweetest horse I own. If I got an Appy I'd call him/her Oddball. Because Melemerby is named after a beach and I wrote a famous horse stories on that! It really fits a skewbald if u have 1! On Howrse I'm westernrider75. I think Paprika is a great name for a chestnut horse because it matches the colour and it is a nice name for a horse anyway. Because my pony's name is Mischief Maker. I chose it because he is always making trouble. He is a stallion. I really don't know why but I guess it's because that's my horse's name but I don't know. You can call your horse Miss, Missy, Little Miss, Little Miss Ladybug, Miss Lady, Miss Ladybug, Little Lady, or Ladybug! It sounds cute! Because I love him. He is the best show pony ever, he is so lovely. I love his colour liver chestnut, he is 13.2. Greek god of deceit plus trickery. Perfect for a spirited, stubborn horse. Because I put a feather in his mane and he looked like an Indian pony. Because its the name of my beautiful Norwegian fjord and she is the best horse you could ever have. Because I go drag hunting. I like this name because it is plain but has style and personality if you give it to the right horse. Also, it's funky and cute. It's different and I don't know any other horse with this name, and he's my fave pony! All horses have something unique about them and it's luck-not only luck, all different sorts of it! It's just a great name. Because I think the moonlight is beautiful, and roses smell great. I think it is so pretty and makes you feel relaxed. They're the names of my favorite character Lisa's horses from the Saddle Club. It is a very pretty name for a horse. He is my first horse ever. I like the name Oats because it reminds me of oats (type of horse food ) if u don't know. Pebbles would definitely be my favorite horse name because when I was 7, Pebbles was my favorite riding pony at my riding school. It's a beautiful, feminine Irish name. I am Irish on my mom's side, so it was important to me to find an Irish name. A great name especially for a powerful black horse! Petter is an islander and 1.40 big. I think this name is simple, but is also mysterious and pretty. I love it, and if I had a mare I would call her this but I have a gelding! Because my horse is the queen of everything. Because I cantered with her for my first time. There is this pony who's name is Over The Moon and I think that, that is a really cool name because the pony is so awesome and would pretty much jump. I had a horse called Patch but she sadly passed away. Because my mom named that before she died. It sounds like the horse is dark and black with shiny black/blue hair in the moonlight. I think it would be a great name for a black horse because at midnight it is very dark and black and Moon Runner would be good for a race horse. Lightning is my fave horse name because it makes me think of jet black stallion with a pure white star or blaze. Gorgeous! That is what I want to rename my horse, because she is lucky to have been saved (from an abusive home). Because horses are so cute. I ride a pony named Peter Rabbit. I like his name because it makes him sound like a bunny. At my stables there are lots of cool names like Libestraum. Why? Well, I like that name and I like dark brown or reddish brown horses and that makes me think of the month October or my birth month, August. This is the best name because it is my horse's name that is why but it is the best because you can have many nick names. Her name is Long Sox but I call her Pippi. You can call him Pop and I imagine a stallion. I really like that name. It's a cool name plus it is the name of my horse. Landscape is a good horse name for a painter because most painters are from a land form which were sunk into the sea most of the 85 million painters survived. I might get a horse named Nevada and it will be my first horse. I am super excited. Because the eye of my horse is like a marble! Because my absolute favorite horse in the world is named that! He's a 4 year old Thoroughbred/Quarter Horse Palomino gelding. It suits him perfectly. I love Oreo for a black and white horse because well it suits an Oreo and horse. My horse's name is Oreo too! He tries to eat things that are black. It's cute and it was the name of the first horse I ever rode. It's a great song and sounds like a pretty name. Maybe for a paint? My favorite mare was named Mustang Sally and it sounds so southern! Plus a great song. I love black horses and I think that is the best name for them. Because that's what my pony's show name is. We call him Lance though. Because it means ready to where and it's so cute. It's a name that others can know that you love your horse. I like naming horses because i have little toy once. I call them all different names and these are the two different names I like. Because if you want a powerful name i guess a god, goddess or planets name is quite suitable. Because I think its a cool name and I'd love a horse called Princess. My first born Arabian filly I've named Lady Brave. She is so beautiful and brave. Because it is my pony's name! I think it is so adorable for a little chestnut gelding! This name is so beautiful and it really suits a black stallion with a strong spirit. I love these names: Merango, Monty, Lucky, Mickey, Peaches. She looks like the princess of the world. She is a quarter horse American paint and very beautiful. She is very muscular. I love the name Mitzi because my 4 year old mare is called Mitzi. It is a cheeky sort of name so it suits some ponies. I think it suits brown or creamy white. Sabastuion, Patricia, Peyroux, Pepsi, Lady, Spirit, Lucy. I think its a cute name. My fave horse name is Mia. I like Mia because it sounds really cute and pretty for a girl horse. Because i got a pony called Moonlight and it really suits it because she was born in the moonlight. She is a grey Highland pony. I have always wanted a Cleveland bay stallion and i would name him Luna! Autumn is a good name for a horse if it is born in the Autumn. Because every time I hear it I think of a wild black Mustang stallion galloping across the desert in Nevada! This is my favorite horse name because my first horse was named Monk and he died Feb.9 of old age. He taught me so much. I will also be grateful for that. Prancer is my fave horse name because my horse loves to prance around with other horses in the field. Prancer fits my little girl! I think its a good name because Quinn is my fave horse at my riding school! Because it's my horses name and my horse is really cool. My horses name is Private and my best friends horse is Jake. I like these names because they sound very easy going and gentle. I've liked Midnight's Dream since I was a little girl. This is my horse's name. I like it because it sounds kinda magical and it suits my horse at least I think it does. Because that is my best horses name and he is my best friend! First I must say, I did not come up with this name. It is from the Thoroughbred series of books so I take no credit. I just think it's a nice horse name. This would be a great name for a black horse. Milly is the name of the horse that I get to ride whenever I want and I love her!